Convict Island was a commercial region in north Irukandji. 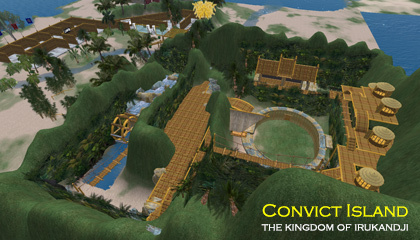 Convict Island followed the 'forgotten kingdom' theme of Irukandji, and was my first and only real attempt to set up a full-on Torean-type combat RP sim. In its earlier guise, Convict Island featured a gladiatorial stadium, slave market, and so on. It was a great bit of escapism. I gave two eager land owners free reign to let their imaginations go wild, hence the terraforming and structures in one of the pictures aren't my doing. They did a great job - a really great job actually - but these types of RPG never really took off in Irukandji. I think it was because Irukandji had so many other public places, love parks, themed roleplaying etc, for people to enjoy. In its second guise, I leased Convict Island to a local brothel owner who built her first business there. A little concerned by its close proximity to central Irukandji, I eventually moved her to outlying Jackaroo Island and reclaimed Convict Island as a normal sim. 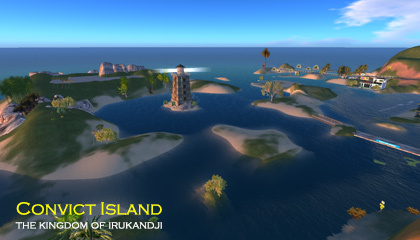 Regions that adjoined Convict Island were Valkyrie Shoals, Valkyrie Island, Tongabuti Bay, Grand Irukandji, Baie de l'Amore, and Nouvelle Kiribas. In all honesty though, Convict Island holds no particular place in my heart. I leased it out for most of its life, and when it wasn't leased, the theme didn't really match the romantic tone of the rest of the estate. 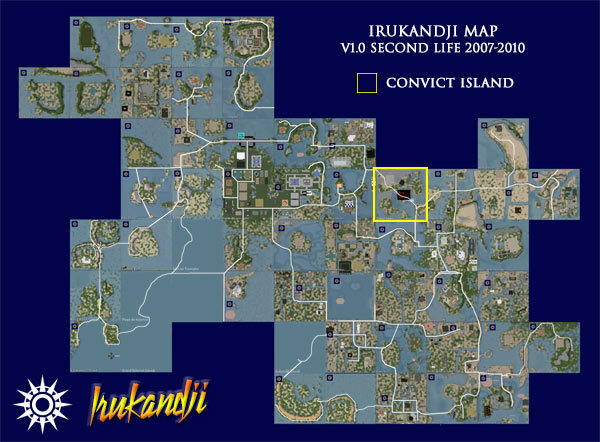 Nonetheless, Convict Island is part of the Irukandji story so it deserves a place in these pages.